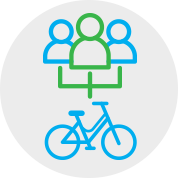 Share the location and access to your bike with friends and family. 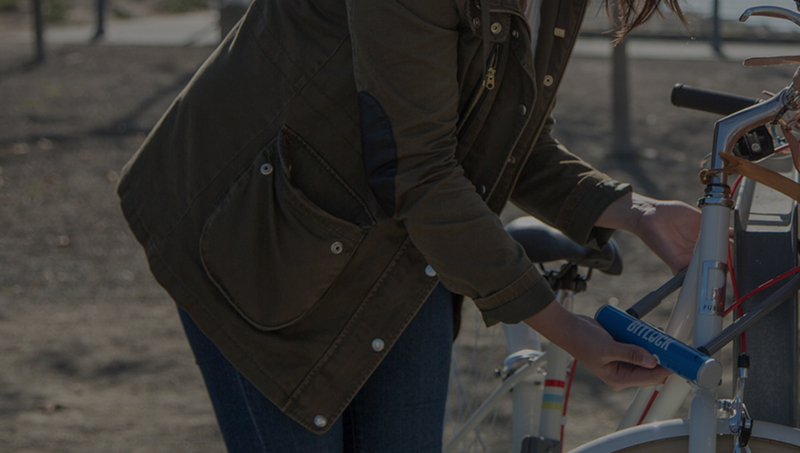 With BitLock, you can create and set up your own bike share system. 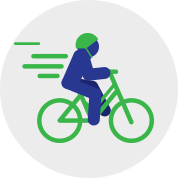 Lock can help you effortlessly keep track of your cycling activity such as trip length, duration and calories burnt. without even having to reach your pocket. 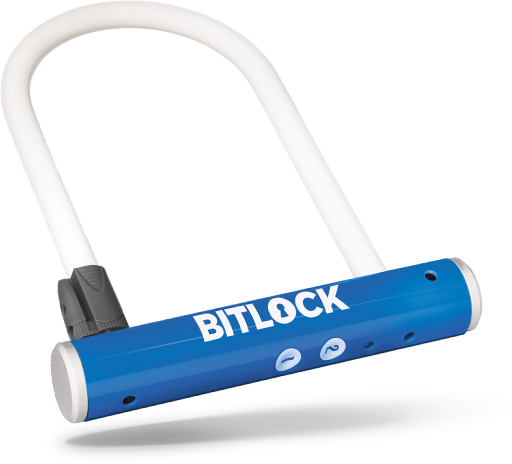 Simply walk up to your bike and press a button on BitLock to lock/unlock in less than a second. Your phone is dead? No problem! You can easily open BitLock by punching in a 4-digit secret code with a sequence of button presses. The combination code can be changed inside the app. With an ingenious design, intelligent power management, advanced battery techonology, low power radio and actuation system, Bitlock can perform 10,000 lock/unlock operations on a single battery. This is enough to provide a 5 year battery life before replacing the battery. Currently, iPhone 4S or 5, 5C and 5S, 6, 6+, (iOS 7 and 8) and most Android phones (made in the last 3 years) running Android Jelly Bean 4.3 or later and equipped with Bluetooth Low Energy are supported. Currently, iPhone 4S or 5, 5C, 5S, 6 and 6 Plus ( iOS 7 and 8) and the following Android phones running Android Jelly Bean 4.3 or later with Bluetooth Low Energy (BLE) hardware are supported: Samsung Galaxy S3, S4, S5, Note 2, 3, 4, Edge - HTC One, Droid DNA, EVO - Motorola Moto X, Droid RAZR MAXX, RAZR M - Google Nexus 4 and 5. 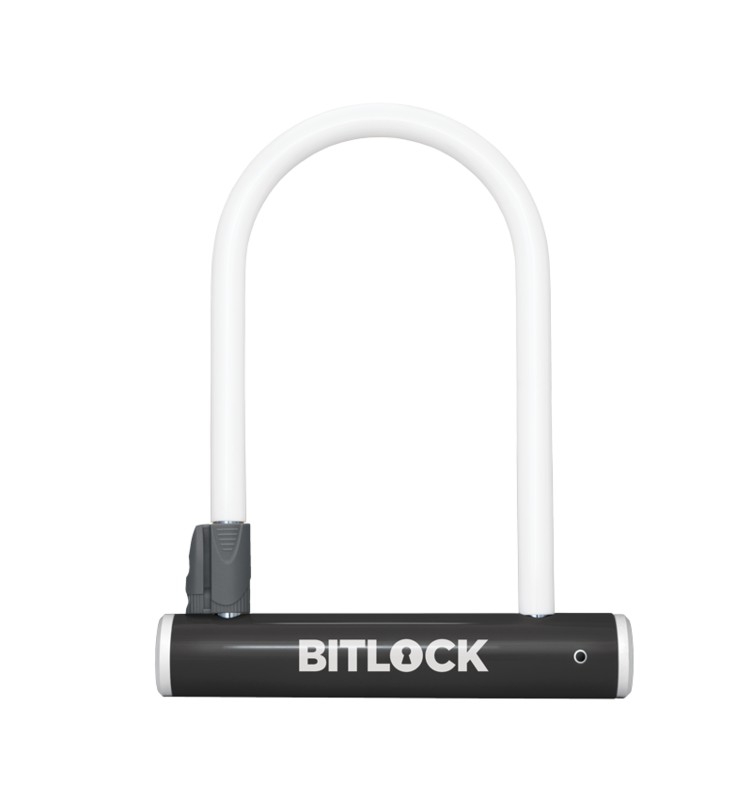 Can I have BitLock shipped internationally? Yes! You can order BitLock to be shipped internationally. The shipping cost for international backers outside of Canada and United States is $35. How long does the battery last on BitLock? With an ingenious design, intelligent power management, advanced battery technology, low power radio and actuation system, Bitlock can perform more than 10,000 lock/unlock operations on a single battery. This is enough to provide a 5-year battery life under average usage (5 lock/unlock operations per day) before replacing the battery. Plus when the battery charge level is low, you get a notification on your smart phone to replace the battery. We use lithium thionyl chloride battery technology, which has the highest energy density among all lithium batteries and has a very low self-discharge rate (%1 per year). So if you don’t use your bike for a long time, the battery still retains its charge. How can I replace the battery inside BitLock? To replace the battery, you must first unlock BitLock and remove the U-shaped shackle. Then use a screwdriver to unscrew the cap at the end of the internal compartment, slide the battery out, insert a new battery, and screw the cap back on. As easy as 1-2-3. Does BitLock operate under inclement weather conditions such as rain or snow? 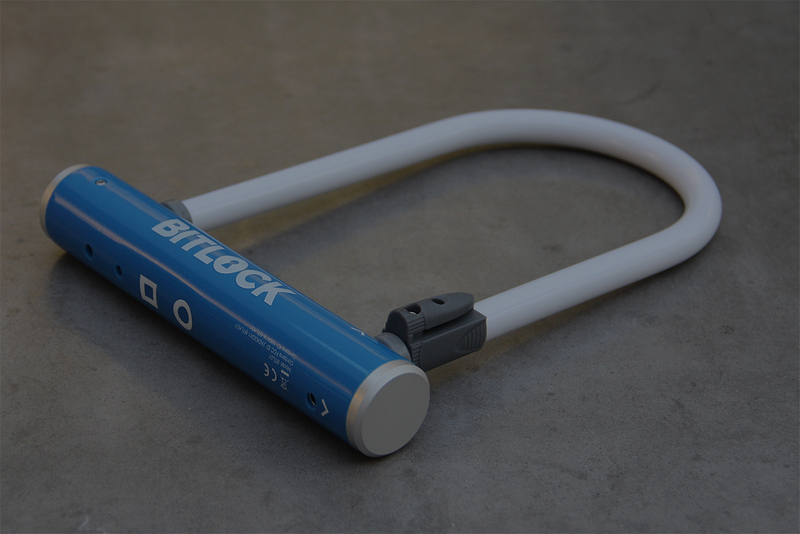 All of the components inside BitLock are properly weatherproofed and sealed inside a plastic compartment. So water, humidity, and dust can’t get inside. The battery can withstand extreme temperatures (-55°C to +125°C), however the system has not been thoroughly tested in extreme temperatures yet. Do I need to have a data connection on my phone to share access with others? Yes. To be able to share access with others, both parties must have an active data connection on their smart phones. Does BitLock work with NFC? No, BitLock doesn’t work with NFC. 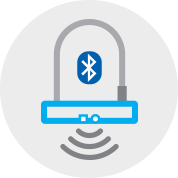 BitLock uses Bluetooth 4 (or Bluetooth Low Energy) to communicate with your smart phone. 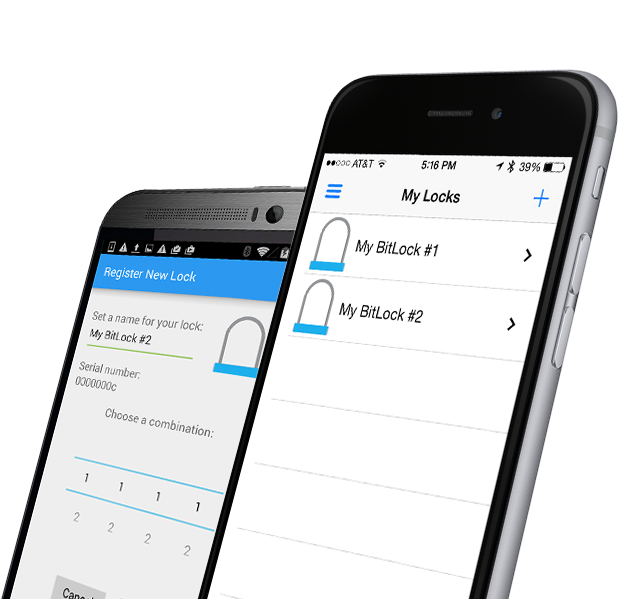 The BitLock app allows you to set a unique 4 digit (decimal) combination code for your BitLock. Memorize or write down the code on a piece of paper, and keep it in your wallet. In case your phone dies, punch in the code as a sequence using the two push buttons on BitLock to authenticate yourself and unlock/lock. To set BitLock into combination mode, you must long press any of the buttons for three seconds. For example if your combination code is 1372, then you must press one of the buttons one time, and the other button three times, the first button seven times, and the other button 2 times. Alternatively, you can also borrow someone else's smart phone (or tablet), log into BitLock application on their phone using your own credentials to lock/unlock BitLock. Your BitLock key is stored in the cloud and can be retreived once you successfully log into BitLock application on any phone. BitLock is made of reinforced and cut-resistant steel and uses a high security disc locking mechnsim and a bent shackle leg. BitLock relies on the same security protocols used in online banking systems. The encryption is based on open and published standards. In the event you lose your phone, you can disable its access by resetting your account password. We also highly recommend having a passcode on your phone to protect your personal data and prevent unauthorized access to BitLock application. Additionally, BitLock app can optionally generate a 16 digit binary code for you when you register the lock. Write down the code on a piece of paper, and keep it in your wallet. In case your phone dies, simply pull out the paper and punch in the code onto BitLock to authenticate yourself and unlock/lock. You can also borrow someone else's smart phone, log into BitLock application on their phone using your own credentials to lock/unlock BitLock. Your BitLock key is stored in the cloud and can be retreived once you successfully log into BitLock application on any phone. Can I use the BitLock app to locate my bike if it gets stolen? There is no GPS inside BitLock and there should not be. Because you want to track your bike not your lock?! Typically bike thieves damage the lock to get your bike and abandon the lock. So tracking your lock will lead you to the remains of your broken lock. It will be totally useless. Instead you can buy a separate GPS tracker from Bike Spike or use Helios Handle Bars that come with GPS integrated inside the handle bar. 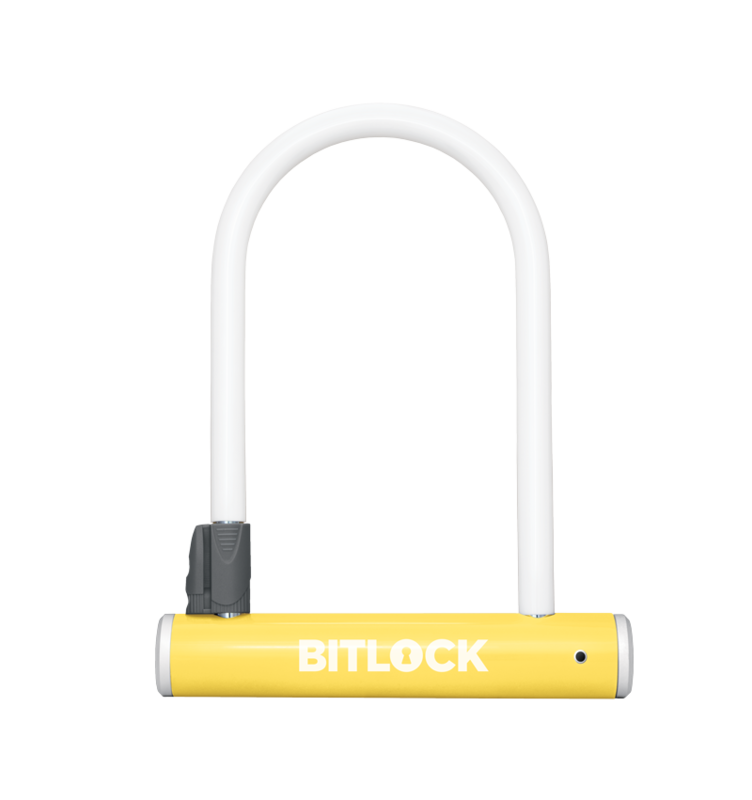 Can I start a bike share program using BitLock? Is there a subscription fee to use BitLock? Stay informed on Bitlock promotions, products and services.